The simply elegant Pleiadi 9 light pendant, by &' Costa, is imported from Italy. 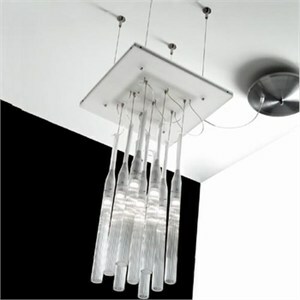 9 Pyrex glass diffusers are suspended from a plexiglass canopy with stainless steel hardware and details. - Dimensons: 13.8" Square X 23.6" H pendant has 6 feet of wire and can be field shortened. - Uses 9 X 20W max 12V (electronic transformer) G4 halogen lamps (not included).